You, my dear readers, are quite the lucky ducks today! I really did NOT want to share this recipe. I'm sorry. I hate to admit this, but I am selfish. I wanted to keep this little secret all to myself. You have recipes like this. The ones that are SO good, SO tasty, and usually SO easy, and SO requested by your fans that you don't want to share your perfect little secret. These are the recipes that make you seem like a kitchen genius! Why would you want to share them? When really, you just learned a little trick or two that makes the dish signature. Completely Julia Child! Julia could not have made a better cookie than this little. humble. chocolate. chip. Michael and I try to eat healthy foods. We use a little too much cheese, but usually our foods tend to be on the healthier side, with less sugar, less saturated fats, and lots of chicken and veggies. I throw all of that out the window when it comes to cookies. Some things you just can't mess with. It's all or nothing baby! Actually, I rarely make cookies, mainly because I know Michael and I will eat ALL of them in about 2 days... and it's just the two of us. (I guess if we had kids all the cookies would all be gone in about 45 seconds!) We're definitely cookie-aholics. So rather than have the temptation, I save them for a special Saturday, birthdays, holidays, or when Michael needs a serious pick me up. These cookies will do the trick. Every. Time. It's funny how we food bloggers seem to get similar ideas at the same time (especially around the holidays!) I promise we are not sending each other memos... it's just a funny, but cool coincidence! 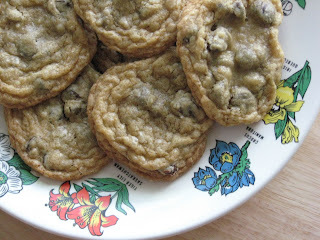 Sea, over at Book of Yum, just posted an excellent essay that shares some WONDERFUL hints on how to make great gluten-free cookies at home, and she also gives a review of some new frozen cookie dough on the market! If I had a bigger home freezer, I'd be trotting it over to Whole Foods right now! One of the best things about this particular homemade dough is that it DOES freeze well. You can separate the dough into individual little cookie balls, freeze them first on a cookie sheet, then toss them into a plastic container and pull out the amount of cookies you need whenever you need them. That's usually too handy for me though, we never make enough to freeze extra! So if you're making Thanksgiving dinner this week: Make a batch of these cookies the day before! You can entertain your guests with a sweet little snack before the big meal. Trust me... by serving these babies before the bird, if the meal somehow doesn't come off as a big hit, your guests will never even notice... they will be so in love with you over your amazing chocolate chip cookies ("ARE you SURE these are gluten free? They can't be! These are better than any cookie I have ever had!" -- This was Michael's reaction when I first made them! Seriously! ), that they will still think you are a kitchen genius! Julia Child, baby! Preheat oven to 350 degrees. In a large bowl: cream butter with sugars until light and fluffy. Add egg and vanilla. In a separate bowl mix together flours, salt, xanthan gum (opt. ), baking powder, and baking soda. Slowly add flour mixture to butter and sugar mixture. Last, mix in chocolate chips. Place tablespoon sized dough portions 2 inches apart on a cookie sheet lined with parchment paper or a silpat mat. Bake 7-9 minutes or JUST UNTIL edges are light brown. Let cookies cool on a wire baking rack or the cookie sheet for 5-10 minutes. This will allow cookies to retain their shape for eating! *Note: Normally, I do NOT like using shortening for baking because it is a trans-fat, and therefore really not good for you. BUT since we only make these cookies occasionally, and since shortening really seems to make a better gluten-free cookie than butter (for reasons why visit Sea's cookie review), we stick to using a butter flavored shortening. Also, xanthan gum is completely optional in this recipe, but I think adding just a tiny bit makes for a chewier gluten-free cookie! UPDATE: These cookies WILL RUN if you choose to use all butter, or margarine, and leave out the shortening completely! If you choose NOT to use shortening, make sure to refrigerate your dough for several hours before baking, this will help to alleviate the cookies spreading too much. Also, the size of the dough placed on the cookie sheet needs to be about 1 tablespoon worth of dough. 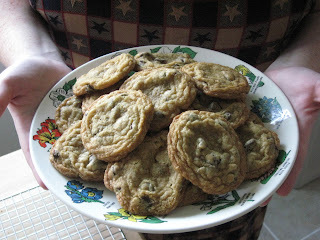 It also helps to bake these cookies on a silpat mat or parchment paper to prevent spreading. 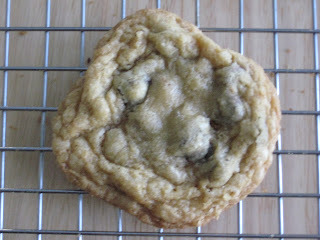 Brad adores chocolate chip cookies - or bascially sugar - so I don't make cookies v. often, either! I come home from work ... and they're gone. And you're right - the perfect c.c. cookie recipe is worth its weight in gold! Abby -- I just knew in my heart Brad was a chocolate chip cookie man! LOL He and Michael are cut from the same cloth! Really, if I never cooked anything ever again and just made chocolate chip cookies forever Michael would be a happy man! Kbabe- Thanks girl!! YES, try the bread with cornstarch! I've done that before too! Works fine! Just watch how much chicken stock you put in the final cubes before baking... I think too little is MUCH better than too much! Otherwise the GF bread wants to be soggy and it takes forever to bake it out! I actually thought about making a loaf of cornbread and using both the GF bread recipe and the cornbread too! Good idea chic!! About the GF Menu Swap.. the theme for this week is actually mushrooms... ;) But I love my garlic, too. In fact, i think the perfect dish would have garlic AND mushrooms. haha. That is one beautiful cookie. I have printed it and am ready to try it out! I DID IT!!! Go check my blog and check out the pix. I used ALL cornbread...(I didn't have patience to bake a yeast bread today! But I'm making your 5 flour bread when I get back from vaca!). It was AWESOME. THANK YOU so much for your encouragement to keep going! I'm just so thrilled. Tastes EVEN BETTER than it ever did glutened (well, from what I can remember). My "selfish recipe" is my Nana's sweet potato pie recipe that was passed down to me and only me. She taught me to add ingredients by taste, so I've purposely never figured out measurements so I have an excuse why I can't share the recipe. 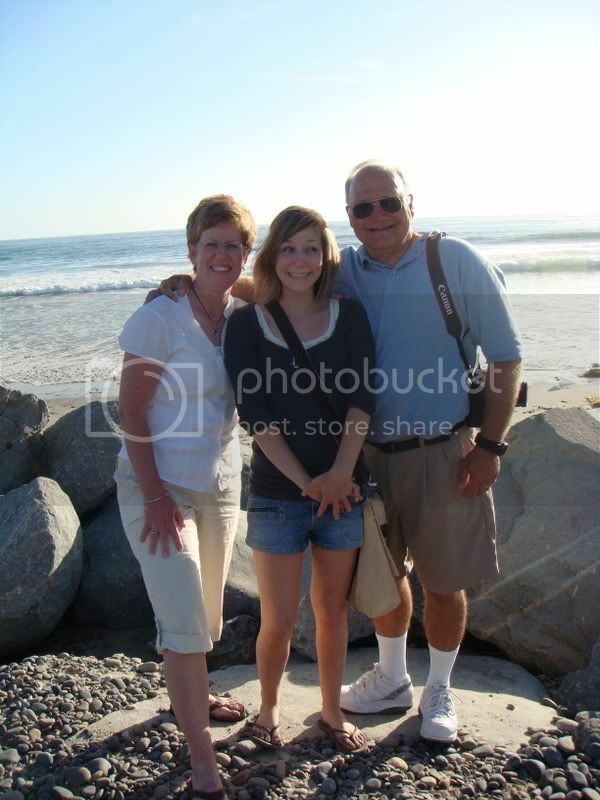 btw, great to find another bloggin' girl from NC! Before I went GF I was KNOWN for my awesome CC cookies....so when I saw these, well, I started a grocery list and I'm going' RIGHT NOW to get everything and I'm making them today! Thanks a bunch, you are an inspiration and Happy Thanksgiving!! Gluti Girl -- I can't wait for you to try the cookies! Please tell me what you think! Thank you so much for commenting! Have a wonderful holiday!! KBABE -- GIRL!!! I am SO proud of you!!! Your stuffing LOOKS AWESOME!! You rock! I am definitely going to make some of your cornbread to add to my bread mixture for stuffing! I can't wait to try it! Your pic is awesome!! What general area of NC are you from?? The cookies look so awesome! I would like to try them sometime but I am going to have to wait a while until I muster up the courage. Baking is NOT going well around here. I'm glad you like the grits! I've only EVER cooked with the quick-cooking kind. I don't have the patience for the others. Do they taste different? P.S. I love that there's no garfava flour in this. The last ones I tried had that as the main flour and they tasted like metal. Yuck! Tamara -- I also forget you don't use milk or eggs do you? ARRRGGhhh.. sorry! 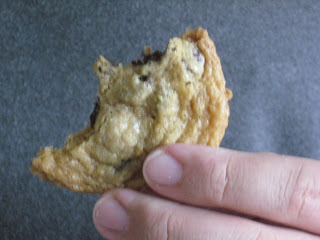 I'm not sure how to do a good cookie without eggs or dairy... but Karina probably does, check out Gluten-Free Goddess... I know the woman has an awesome allergen free cookie recipe! Mary Frances -- I can't wait for you to try them chic! PLEASE tell me what you think when you've made them! I PROMISE these won't taste like metal... oh baby these are good!!! I actually can do eggs so it is not so bad. I will check that out and see when I get up the nerve to try it ;-) Thanks! Thank you for sharing this! These are amazing. This has totally sealed the deal for me that I'm okay not using what flour. Mmmmmmm. oh my. typo in that last comment. I meant wheat flour of course. And after enjoying these all week I had to come back again and say, hoorah, these are so so good. I have much hope for recreating my favorite Christmas cookies in the next couple of weeks. These look great! I just baked one cookie sheet and I have a question (I haven't tried them yet as my kids & I are going to taste test these with Alton's GF recipe). I had to bake them twice the amount of time to get them brown around the edges. I was queen of the gluten ccc, so I know how this goes. The telltale sign that things weren't going well in the oven was the lack of the "swirl" look in your pics of the cookies. Also, I don't have good luck with the Hain GF BP. What do you use? Finding this recipe was exciting!!! Hmmmmm... I'm not sure Juliana! I'll have to make them again in Feb. to find out why you are having to bake them for longer... are you at a higher altitude any chance? Also, I use "Clabber Girl" baking powder, which is specifically gluten free! It works like a dream! I hope this recipe will work for you! I haven't tried Alton Brown's version! We love these cookies! As a matter of fact they are the first thing I am baking when we are off the sugar free thing at the end of January!. By chance did you use butter in your cookies?? Butter really causes GF cookies to spread, using butter flavored shortening works great and turns out an incredibly good cookie, even though I prefer not to use hydrogenated fats. This is one instance in which I will! These cookies are worth it! Thanks so much for trying them! Your cookies won our taste off! They are as awesome as my gluten ccc! I baked a second batch today and took them out at 12 minutes at 375 and they were perfect. I'm about as close to sea level as one gets, so I don't think it's the altitude with the baking time. No biggie. Also, I don't use Clabber Girl, as it has aluminum in it. Believe it or not, my husband can taste it. He hated anything with bp in it until I figured out it was the aluminum. I used Rumford until recently. I thought the little bit of gluten in it wouldn't hurt...wrong! I made scones today and they rose beautifully with the Hain. New jar. Julialuli! YAY!! I'm so glad that you liked the cookies!! We LOVE them! I can't wait to make them in February! YES, a new container of baking powder!! It's amazing how quickly it will go bad! I usually restock every 2-3 months, just in case! I had no idea that clabbergirl had aluminum in it! We've never noticed! Your husband must have more sensative taste-buds than I do! Well thank you for your taste test trials! I'm so glad you liked my cookies so much! It made my day! I can't believe I beat Alton Brown! You're right, butter spreads it out a lot! Still delicious. I just can't bring myself to bake with shortening, so I'll enjoy my thin little gooey ccc. Thanks! I used 1 Tbsp milled flax seed and 3 Tbsp water in place of the egg and it worked great, in case you ever find yourself short an egg in the fridge. Good Omega 3's, and I find the rise is often better than an egg. Kelly! Thanks for the great advice about the cookies! YES, butter does make the cookies spread quite a bit. I will definitely remember your hint about the milled flax seeds! I keep whole ground flax seed on hand at all times to throw into whatever I'm baking, but I've never actually used it as an egg replacement. I will try this sometime! Thanks again for trying them!! Peggy -- YES! It is possible (and I'm kicking myself for not thinking of that for my husband tonight for Valentine's!!) BUT you will need to cook it longer or it will fall apart. You will have to use your own judgment because if it cooks TOO long it will become too hard. My immediate guess is about 15-18 minutes, but that is just a guess. I would LOVE to know how it turns out for you! Please come back and share with us!! I tried these cookies. I think they have potential, but will not use coarse salt in the future. Also I think I am going to leave out the xantham gum as I desire a crunchier cookie. But they got good reviews from one of the gluten gluttons in our household. Come and see our full review. Have you ever had a problem with tapioca flour tasting bad? The first time I made these cookies, they turned out fantastic! Then, I got a new package of tapioca flour and they were horrid. I had to throw them out! I tasted all the flours I used, and the culprit is tapioca. It has a "barnyard" taste. Yuck. Just curious if you've ever had a bad batch of tapioca? Nadine -- So glad you like these cookies! They are THE cookie around our house!! YES, tapioca starch can be rancid or go back. I think it's more of a batch problem than it is the actual tapioca, so don't give up on tapioca, I've only had one or two bags of tapioca starch that were not good! thankfully most are very well produced! I tried the exact Revised version recipe except I have to use Ener-g Egg Replacer instead of eggs. The cookies were kind of doughy. My daughter still loved the taste. But any thoughts? Hi Sonja! I have not made these cookies egg free yet, but from what I have heard from other readers, replacing the egg with a ground flax replacement works well (1 tablespoon ground flax seed mixed with 3 tablespoons water, -- let it sit for several minutes to congeal and then add it to the recipe as called for) I wish I had a better answer for you, but I'll definitely try this out sometime and tell you what i think! If you try the flax seed replacer let me know!! 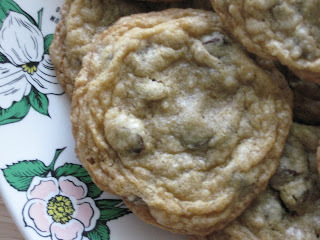 I made these last weekend, they were the BEST chocolate chip cookies EVER. I added 2 Tbls of flax seed and 1 Tablespoon of soy flour to replace the egg. Wanting to try these cookies...can you use coconut oil instead of the shortening, or maybe a mix of butter and coconut oil? I know it's not a huge deal to use shortening every now and then, but I don't have any at the moment. Thanks in advance! Noel & Ali - You can make these cookies with coconut oil, but I only recommend using HALF the amt called for. So only use 1/4 cup, and be aware that the cookies will run when using coconut oil. You can also use half the amt. spectrum palm shortening (1/4 cup) and they turn out really good as well with less spreading. These cookies are fab!! I made them (with a few modifications) the other afternoon and they were and still are delicious. My hubby and two boys aged 2 and 10 months both loved them too. I have no idea what sorghum flour is and in the past have researched but couldn't seem to get it in the UK. I am sure I could get it shipped from the US but that would make it expensive so I just substituted soya flour (I know you have a soy sensitivity so that wouldn't work for you). I also don't really understand about your different American shortenings and I don't have a casein problem so I used butter. The cookies worked really well though - you can taste the soya flour but not in a bad way! Can I substitute Domato' flour for the flours listed? Also, i'm new to this and am having difficulty with baking times and baking temps. Some people say to convert a recipe to GF just decrease bake temp by 25 degrees and increase cooking time. Any helpful hints. Thanks. delicious thank you. i'd never know they were gluten free/dairy free if i didn't make them myself. Added some lemon zest and bit of nutmeg. Also used all brown sugar for the sugar and 1.25 cups of bob's red mill gluten free all purpose flour instead of the individual flours. Just made these today and they were delicious as promised. Even my gluten eating husband thought they were good! (I did use white rice flour and palm shortening, but otherwise followed the recipe exactly). Thank you for posting such a great cookie recipe!